Lifehouse's new album, Smoke & Mirrors, won't be released until March 2nd, but fans can get a sneak preview right now of five songs from the album on the band's official website, LifehouseMusic.com. Register on the site (using email or a social networking account) to listen to song samples and watch exclusive video clips about the recording process, the stories behind the songs, and more. 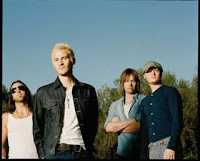 The first single from Smoke & Mirrors, "Halfway Gone," is the fastest growing single of Lifehouse's career and is currently on the Billboard Hot 100 chart. Download the song now on iTunes, and stay tuned for an exclusive Smoke & Mirrors pre-sale starting on Tuesday, February 16th.